Chicago had its Cow Parade. Dubai had its Camel Caravan. Marc Spits started Elephant Parade in 2006, but unlike most other animal-centric public art installations, his life-size artworks were to serve a purpose outside of their aesthetic pleasure: they were to raise awareness (and funds—$6 million to date) for the dwindling Asian elephant species, and you can admire seven of the sculptures at L.A. Live until tomorrow, Friday, at 7p.m. On a business trip to Thailand, Spits visited an elephant hospital where he met Mosha, a baby elephant who had lost a leg after stepping on a landmine. Spits was inspired by her plight and helped support the animal in receiving a prosthetic leg (the first of its kind). His experience led to the birth of Elephant Parade, an open-air exhibition featuring ornately decorated statues of baby elephants as designed by acclaimed artists, celebrities, and, often times, local luminaries. The inaugural Parade took place in Antwerp, and subsequent Parades have shown in cities like London, Milan, Copenhagen, and Singapore. In August, the organization made the hop across the pond and settled in Dana Point for its first ever North American event, featuring 37 new and uniquely curated statues. So why anchor the exhibition in a smaller town rather than a large-scale city like L.A.? According to Elephant Parade spokesperson Matt McNally, the outfit chose Dana Point due to its conservation movements surrounding blue whales, which are the world’s largest sea mammals. “There’s a tie in there with elephants seeing as they’re the world’s largest land mammals,” he says. “That synergy of the message made a lot of sense.” Nevertheless, Elephant Parade wanted to get Los Angeles involved, which is how a handful have found their way to the courtyard at L.A. Live. “The inevitable goal is to drive global awareness of the plight of the Asian elephant, so we felt it was necessary to bring it to the city that is on Southern California’s forefront of culture,” McNally says. Though the L.A. Live elephants will be packing their trunks tomorrow evening, they’ll still be on display in Dana Point until November 7th, after which they’ll be up for bid at the Elephant Parade Grand Auction on November 17th. Eighty-two figures will start at a cool $3,000 (not shabby when you realize that the most expensive elephant sold in London for $242,000). 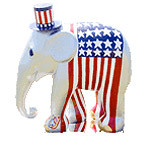 For more information of attending the auction, purchasing, or pre-bidding, email auction@elephantparade.com. Next article16 Ways to Spend the Weekend in L.A.: Zombies, Giants, Sriracha, Haunted Houses and More!